It's Canada's 150 Birthday so its time to eat cake! This post is originally from June 30 2011, but I'm on break and wanted to revisit some of my favourite Summer dishes. Enjoy! This dessert lovin' gal is NOT a fan of trifles that leave you with a soupy mess in the bottom of the bowl. If you were hoping for a recipe like that, you'll have to keep looking. This recipe uses fresh strawberries because they are in season right now. Another version uses canned mandarin orange segments (drained very well) and orange Jell-O instead of Strawberry. Sugar-free Jell-O and low fat Cool Whip were used so I don't feel like I'm cheating too much. Which is good because I have already eaten half of this dessert and have another prepared for our family picnic. Cool Canada Day Strawberry Trifle. 1 1/2 cups of Cool Whip, frozen/ thaw and reserve the rest for layers and topping. Bowl #1 will be the one you use to assemble the trifle, so keep that in mind when choosing which bowl you start with. This mixture will separate to look like Jell-O on the bottom and mousse on top. 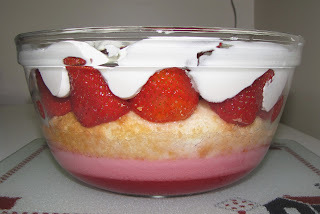 It will also be the base layer of your trifle. Mix your Strawberry Jell-O with 1 1/2 cups of boiling water. Stir in 1 1/2 cups of frozen Cool Whip. Will look lumpy, stir about 5 minutes to get a smooth mix. Set in fridge for approximately 2 hours. (Bowl #2) Cut your 1 1/2 cups of strawberries and add 2 teaspoons of Splenda (I use the kind that measures cup for cup like sugar). Set in fridge until needed. 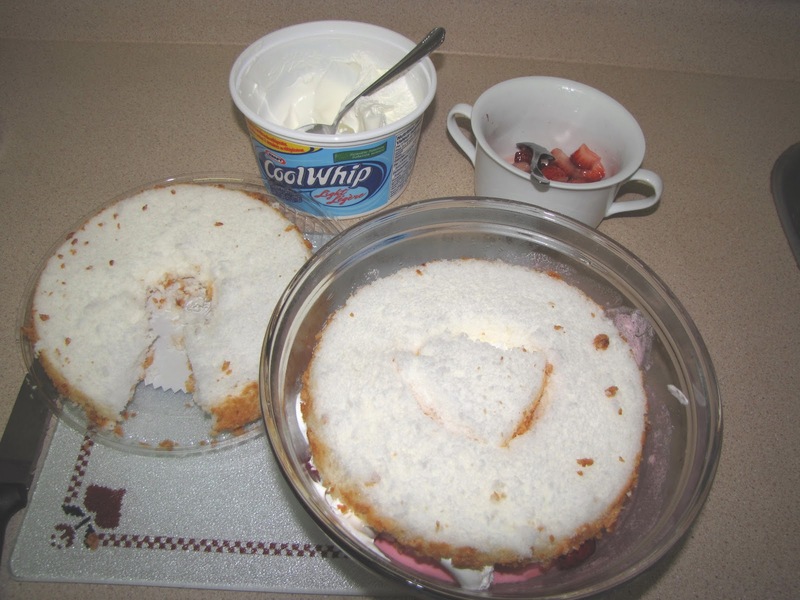 Cut your frozen Angel Food Cake once to make two rings. Use the biggest ring for layering, the other ring will be cut into sections to fill in spaces as needed, ie. center hole. Start assembling layers when the Jell-O Mixture is set. Spread a thin layer of Cool Whip on the Jell-O before adding the cake. Lay Angel Food ring on the Jell-O + Cool Whip Mousse base. 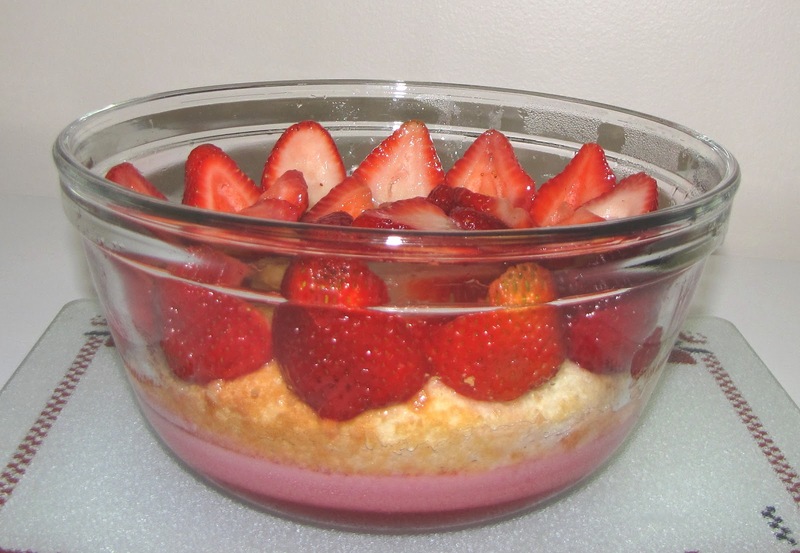 Arrange the strawberries around the side of the bowl, and spread more out evenly across the cake. Add 1 1/2 cups of thawed Cool Whip. Smooth the Cool Whip topping until entire cake layer is covered. Use fresh, sliced strawberries as garnish for the top. Use Raspberry Jell-O and raspberries instead of Strawberry Jell-O and strawberries. 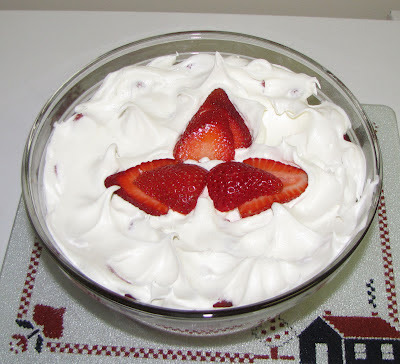 Use whipped cream for layering, instead of Cool Whip. Not sure it would work in making the Jell-O Strawberry Mousse though. Use vanilla cake or sponge cake instead of Angel Food Cake. **Recipe for Strawberry Jell-O Mousse is adapted from recipe found on Jell-O powdered gelatin box.